Year 5 and Year 6 pupils at Weston Primary have been busy creating a series of prehistoric animal sculptures as part of their summer term topic on dinosaurs. All classes have been learning about fossils and prehistoric animals, under the expert tutelage of the teachers and teaching support staff. A team member at Everything Dinosaur, who visited the school in support of the term’s teaching topic, was given a guided tour of the palaeontology area by Reception/Year 1 children. A part of their classroom had been set aside so that the children could show the “pieces of dinosaur” that had been excavated from a sand pit, as well as the some of the safety equipment that palaeontologists wear when digging up fossil bones. In a day of dinosaur themed teaching activities, Year 1/2 pupils learned how to identify fossils, whilst Year 3/4 students discovered that they had all technically eaten dinosaurs, apt as their dinosaur themed workshop concluded shortly before lunch. During lunchtime, the Everything Dinosaur team member was able to take some pictures of the artwork being created, the lawn area just outside the staff room was beginning to resemble Weston Primary’s own “Jurassic Park”. The Year 5/6 pupils under the supervision of Miss Emmison and Mr Kelly had created several pieces of prehistoric animal themed art. Each sculpture had been carefully created and the children had spent part of the morning painting their Mesozoic monsters. During their afternoon dinosaur themed teaching workshop, the Everything Dinosaur team member congratulated the pupils on their artistic efforts and although the artwork was not finished, he was able to identify which extinct animal each sculpture represented. Spinosaurus, with its famous two-metre high sail lived in North Africa during the Cretaceous. The arm bones of this huge predator have never been found, yet the pupils have created their replica as a biped (walked on hind legs), most palaeontologists agree, this carnivore probably walked on its two back legs. The brown coloured, armoured dinosaur has the bony tail club associated with Ankylosaurus, a dinosaur so heavily armoured that even the bone above its eyes was thickened and reinforced. School teacher Miss Emmison explained that a baby Brachiosaurus was created as trying to make a model of an adult, long-necked dinosaur would have probably used up too much newspaper and paint. The largest dinosaur exhibit in Europe is that of a Brachiosaurus. The head of the dinosaur skeleton is something like forty-three feet of the ground. School creates T. rex statue. No dinosaur theme park would be complete without a sculpture of the most famous dinosaur of all T. rex. The pupils have opted for a green Tyrannosaurus, although the colouration of this dinosaur is not known. T. rex may even have been covered in feathers. School children create model of "Roof Lizard"
The Stegosaurus model has his plates on his back and spikes on his tail. Stegosaurus was named and described in 1877, the name means “roofed or plated lizard”. Weston Primary's "Three Horned Face"
In the process of being painted battleship grey, the horned dinosaur model is being prepared by Year 5/6 school children. Triceratops was one of the last of the dinosaurs, just four weeks ago, scientists working in the western United States discovered the fossilised remains of three Triceratops, perhaps this is evidence of this type of herbivorous dinosaur living in small, family groups. 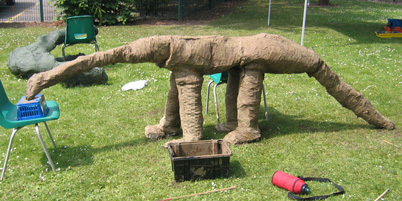 The school children at Weston Primary have not just been working on dinosaur sculptures. The pupils have created a model of a flying reptile, a Pterosaur. Such is the accuracy of the artwork, that the team member at Everything Dinosaur was able to identify the sculpture as being that of a Pteranodon and he had a go at naming the species – Pteranodon longiceps. The shape of the crest on the back of the head can tell a palaeontologist which species of Pteranodon this is, the long crest indicates P. longiceps. Once the sculptures have been completed the school will have its very own “Jurassic Park”.